Today's growing businesses are both placing more demands on and relying more on their network. Companies are putting more applications and demands on their Ethernet Infrastructure. Using VoIP phones and IP cameras require more than simple plug-and-play connectivity. Additionally, Internet-based applications such as Hotmail and Google Calendaring have made keeping the network up a business-critical need. However, companies do not necessarily have more money or advanced training to deal with complex managed switches. NETGEAR's new ProSafe Plus Switches meet this growing need by providing easy to use visibility and limited configuration capabilities. To provide more insight into the network behavior, ProSafe Plus Switches offer traffic monitoring for users to observe traffic behavior. 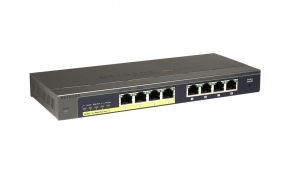 Additionally, if there are connectivity issues, these switches offer a cable diagnostic test capability that can identify and even locate problems in the cables. To optimize traffic through the switches, ProSafe Plus Switches offer both port and tag-based prioritization to keep latency-sensitive traffic moving ahead of less critical packets. Also, as a means of improving security or managing collision domains, ProSafe Smart Switches offer VLAN technology. ProSafe Plus Switches offering these monitoring and configuration capabilities at a slight cost premium over un anaged switches, delivering great value to the end user. Additionally, furthering NETGEAR's support of the environment, ProSafe Plus Switches have power-saving Green Ethernet technology. The GS108PE switch comes in a sturdy metal case with a fan-less design for silent operation. •	Dimensions (H x W x D): 27 x 235 x 103 mm.